KNI aims at, “providing quality healthcare service for all patients at affordable price”. 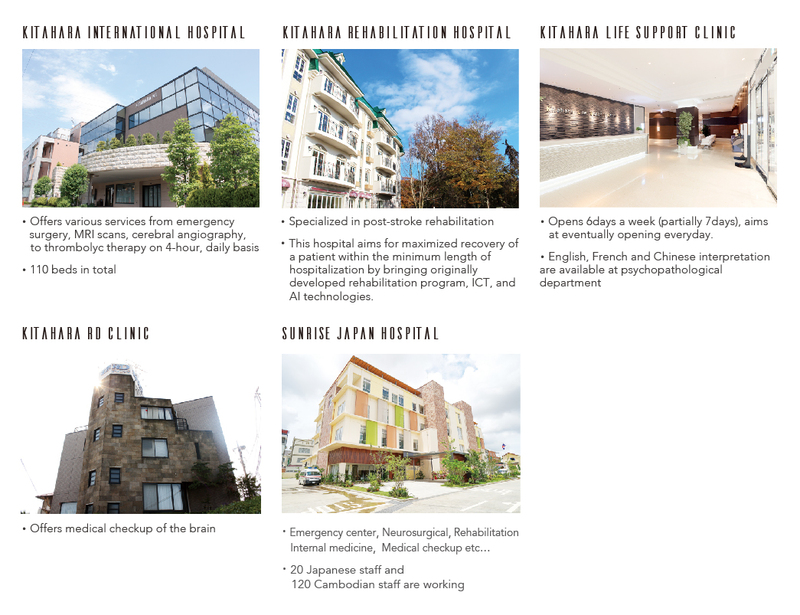 Under the philosophy, KNI has been devoted itself to provide quality medical service with advanced technology and equipments to the community and people at Hachioji-city as well as in Japan. KNI was established in 1995 at Hachioji city, the skirt of Tokyo, Japan. Start from a hospital specialized in neurosurgery, KNI has grown into a medical institute which consists of 2 hospitals and 2 clinics to provides comprehensive medical service to patients in neurosurgery and cardiology throughout all the stages of the medical care from preventive treatment to rehabilitation even after patient’s recovery and discharge from hospital. Our main hospital，Kitahara International Hospital，has No1 outcome for the treatment of cerebral infraction in Tokyo. Each hospital and clinic of KNI is equipped with state-of-the-art facilities and the latest medical technology so that patients can always receive the best possible medical care. KNI has been strived to deliver high quality, cost-effective healthcare not only in the community we serve but also as many countries in needs as possible. Kitahara Medical Strategies International Co., Ltd one of the Kitahara group has been promoting the outbound style’s medical exportation which aims to build up the medical system such as local production and for local consumption by stepping into the developing country actually. We have opened the hospital named Sunrise Japan Hospital(SJH) in phnom penh, Cambodia since 2016. Dr. Shigemi Kitahara is the founder of the KNI. He established the first facility in 1995. He is a neurosurgeon, and he keeps the vision of providing better medical service to wide range of people both domestically and internationally. Besides the management of medical institutions, he has operated a business firm named Kitahara Medical Strategies International Co., Ltd and a non-governmental organization named Japan Medical Development Organization (JMDO) in order to conduct international programs for health sector development. The term “advanced clinical training” means the foreign practices engage in medical practice which are conducted at a hospital designated by the Minister of Health, Labor and Welfare (hereinafter referred to as a “designated hospital” in this item) under the on-site instruction and supervision of a medical clinical instructor. It aims for promoting international exchange in the medical area and improving of medical level in the developing country, and also it approves as a special system that foreign practices who have entered Japan for the purpose of learning medical knowledge and skills can engage in medical practice in Japan. Our hospital is recognized as “Foreign doctors advanced clinical training designated hospital ” and positively accept the foreign practices. KNI is specialized in neurosurgery and cardiology. KNI provides medical services to the patients with neuro- and cardio-vascular diseases such as stroke, aneurysms, and heart disease.